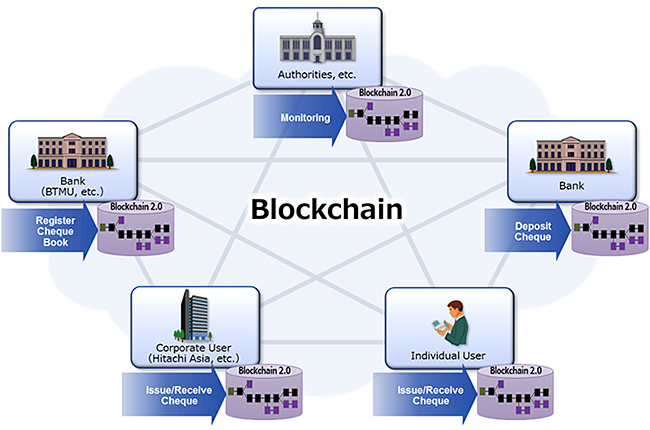 Singapore, August 22, 2016 --- Hitachi, Ltd. (TSE: 6501, Hitachi) and the Bank of Tokyo-Mitsubishi UFJ, Ltd. (BTMU) today announced that they have started Proof of Concept (PoC) testing for using blockchain technology*1 for digitalization of checks in the Republic of Singapore. In this PoC testing, Hitachi and BTMU communally developed a system in which blockchain infrastructure are used for issuing, transferring and collecting electronic checks. Using the system, BTMU issues and settles checks and some of Hitachi Group companies in Singapore receive the electronic check and deposit the funds. Through the PoC testing, Hitachi and BTMU will be able to identify issues from various perspectives such as technology, security, operation, and legal perspectives, and aim to realize new FinTech*2 services including digitalization of checks. In recent years, various efforts towards providing new financial services that utilize blockchain technology and making financial services more efficient have been accelerated. Blockchain is a technology which makes difficult to tamper the data, sharing the data related to processes among multiple computers over networks. With applying blockchain technology, it is expected to reduce system investments and to realize providing reliable and convenient financial services. The Monetary Authority of Singapore has recently released a consultation paper on proposed guidelines for a regulatory sandbox framework to facilitate the advancement of FinTech services. With the framework, this PoC testing aims to identify issues for practical use, issuing and settling check by blockchain technology on a system developed by Hitachi Asia Ltd., the Asian regional headquarters of Hitachi, Ltd. and BTMU as one of the collaborative creations between Hitachi and BTMU in the Asian region. The digitalization of checks makes it possible to automate the workloads of intermediaries for checks in financial institutions, to avoid tampering and to speed up settling checks. In addition, it is expected that similar approaches can be applied to payment and supply chain finance in non-financial sectors in the future. Blockchain technology: A distributed ledger technology which maintains an immutable ledger by synchronizing same data records via a peer-to-peer network. FinTech: A combination of the words finance and technology, FinTech refers to innovative financial services using information technology and activities to create these financial services. Hitachi, Ltd. (TSE: 6501), headquartered in Tokyo, Japan, delivers innovations that answer society's challenges. The company's consolidated revenues for fiscal 2015 (ended March 31, 2016) totaled 10,034.3 billion yen ($88.8 billion). The Hitachi Group is a global leader in the Social Innovation Business, and it has approximately 335,000 employees worldwide. Through collaborative creation, Hitachi is providing solutions to customers in a broad range of sectors, including Power / Energy, Industry / Distribution / Water, Urban Development, and Finance / Government & Public / Healthcare. For more information on Hitachi, please visit the company's website at http://www.hitachi.com. About The Bank of Tokyo-Mitsubishi UFJ, Ltd. The Bank of Tokyo-Mitsubishi UFJ, Ltd. (BTMU), a member of Mitsubishi UFJ Financial Group, Inc (MUFG), is Japan's premier bank, with a global network spanning close to 50 countries. Outside of Japan, BTMU offers an extensive scope of commercial and investment banking products and services to businesses, governments and individuals worldwide. In the Asia and Oceania region, BTMU has presence in 13 key markets with 33 offices and close to 4,000 employees serving largely corporate and institutional clients. Singapore serves as the regional headquarters for South Asia, South-east Asia (ex. Thailand) and the Oceania region since July 2013, while the regional headquarters for East Asia including China is located in Japan. BTMU's parent, MUFG, is one of the world's leading financial groups with total assets of approximately 298.3 trillion yen (US$ 2.6 trillion) as of March 31, 2016. MUFG's services include commercial banking, trust banking, securities, credit cards, consumer finance, asset management and leasing. The Group's operating companies include BTMU, Mitsubishi UFJ Trust and Banking Corporation (Japan's leading trust bank), and Mitsubishi UFJ Securities Holdings Co., Ltd., one of Japan's largest securities firms. MUFG's shares are traded on the Tokyo, Nagoya, and New York (NYSE: MTU) stock exchanges respectively.